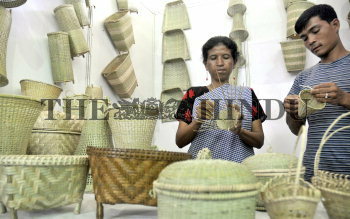 Caption : HYDERABAD (AP/ BL/ STATES PAGES ) -22-03-2011- Mr . Liehshai Kynter and his wife , a bamboo craftsman from East Khasi Hills , Cheerapunji in Meghalaya make delicate flower vases at the Gandhi Shilp Bazzar promoted by the Ministry of Textiles in Hyderabad on Tuesday , for artisans from all over the country . Bamboo flower hangings , baskets , lamp shades and fruit baskets made by artisans range from Rs 150 to Rs 600 . PHOTO: P_V_SIVAKUMAR .